Because you cast on an odd number of stitches, each row ends with a knit 1. When you turn it around to work in the other direction, you work a knit right on top of the last knit stitch, and a purl on top of a purl stitch. This creates this bumpy texture. 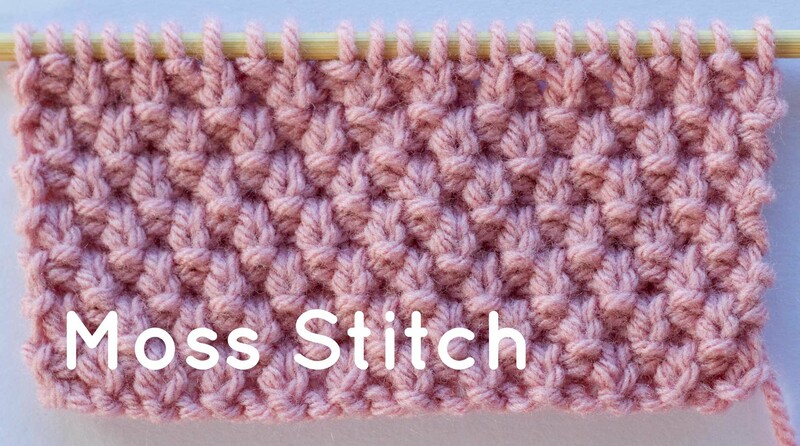 Ribbing is made the same way as moss stitch, but you start out by casting on an even number of stitches. In this case, when you finish a row, you end with a purl stitch, and when you go back in the other direction, you work a knit stitch on top of that purl stitch, and then a purl on top of a knit stitch, all the way across. A ribbed piece has a lot of stretch to it, so it is often used for sweater cuffs, or the bottom of hats, etc. Moss/seed stitch does not stretch much, and will also make the fabric lay flat, rather than the curling you often get with stockinette stitch (all knit stitches in one direction, all purl in the other). A quick hint I will add for newbies working moss/seed stitch. When you get to the end of the row, and turn your work, your yarn will be in front of the work, in position for a purl stitch. In order to work a knit stitch, you have to get the yarn to the back of the work, which you do by carrying the yarn underneath the needle to the back of the piece. A problem that many new knitters run into is that they actually wrap the yarn over the top of the knitting needles to get it to the back of the work, and then when they work back to that end, they accidentally work this additional loop as if it was a stitch. This is also an issue when working the knit stitch in both directions (called garter stitch), and is the most common reason so many new knitters find that their pieces get wider as they work (and have holes at the edges). *Please note that the second picture actually shows a piece knit using brioche stitch, but it does such a good job of illustrating the ribbing pattern that I used it anyway. ETA: As @jkadlubowska pointed out, the picture labeled Moss Stitch actually shows double moss stitch, meaning that you can actually see are two knit "Vs" and two purl bumps. But just like the brioche stitch sample, I think it easier to see the knit Vs and purl bumps in this picture, so I am leaving it as is. Not the answer you're looking for? Browse other questions tagged knitting technique-identification or ask your own question. What material is this Jumper made of? Why do I keep getting a loop when knitting?